^ a b c Del Centina 2008, p. 373. ^ Case & Leggett 2005, p. 39. ^ Mackinnon, Nick (1990). "Sophie Germain, or, Was Gauss a feminist?". The Mathematical Gazette 74 (470): 346–351, esp. p. 347. ^ a b Del Centina 2005, sec. 1. ^ a b c d Gray 1978, p. 47. ^ a b c Moncrief 2002, p. 103. ^ a b c d Gray 2005, p. 68. ^ Osen 1974, pp. 83–84. ^ Ogilvie 1990, p. 90. ^ Osen 1974, p. 84. ^ a b c d e f g h Gray 1978, p. 48. ^ Gray 1978, pp. 47–48. ^ a b Osen 1974, p. 85. ^ Gray 2005, p. 69. ^ a b Mackinnon 1990, p. 348. ^ a b c Del Centina 2005, sec. 2. ^ a b c Sampson 1990, p. 158. ^ Del Centina 2008, p. 352. ^ Sampson 1990, p. 157. ^ a b c d e f g h i j k l Gray 2005, p. 71. ^ a b Dickson 1919, p. 733. ^ a b c d Del Centina 2008, p. 355. ^ Osen 1974, p. 88. ^ a b c d Dunnington 1955, p. 67. ^ Mackinnon 1990, p. 349. ^ Bell 1937, p. 262. ^ a b c d Gray 1978, p. 49. ^ Osen 1974, pp. 88–89. ^ a b c d Petrovich 1999, p. 384. ^ a b c d e Gray 1978, p. 52. ^ a b c Petrovich 1999, p. 386. ^ a b c Petrovich 1999, p. 385. ^ Ogilvie 1990, p. 91. ^ a b Ullmann 2007, p. 31. ^ Del Centina 2005, sec. 4. ^ a b Del Centina 2008, p. 357. ^ Del Centina 2008, pp. 356–357. ^ Del Centina 2008, p. 362. ^ a b Del Centina 2008, p. 349. ^ a b c Del Centina 2008, p. 372. ^ Dickson 1919, p. 763. ^ a b c Cipra 2008, p. 899. ^ Del Centina 2008, p. 371. ^ Gray 2005, p. 73. ^ a b Osen 1974, p. 91. ^ Gray 1978, p. 53. ^ a b Ogilvie 1990, p. 92. ^ Del Centina 2005, sec. 5–6. ^ a b c d Mozans 1913, p. 156. ^ a b Gray 1978, p. 50. ^ a b Mackinnon 1990, p. 347. ^ Dickson 1919, p. 769. ^ Ogilvie 1990, p. 201. ^ Osen 1974, p. 90. ^ Gray 1978, p. 51. ^ Petrovich 1999, p. 384–385. Bell, Eric Temple (1937). Men of Mathematics. Simon and Schuster. reprinted as Bell, Eric Temple (1986). Men of Mathematics. Simon and Schuster. ISBN 0-671-62818-6. Case, Bettye Anne; Leggett, Anne M. (2005). Complexities: Women in Mathematics. Princeton University Press. ISBN 0-691-11462-5. Cipra, Barry A. (2008). “A Woman Who Counted”. Science 319 (5865): 899. doi:10.1126/science.319.5865.899a. Del Centina, Andrea (2005). “Letters of Sophie Germain preserved in Florence”. Historia Mathematica 32 (1): 60–75. doi:10.1016/j.hm.2003.11.001. Del Centina, Andrea (2008). 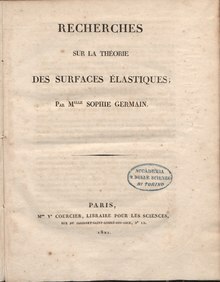 “Unpublished manuscripts of Sophie Germain and a revaluation of her work on Fermat's Last Theorem”. Archive for History of Exact Sciences 62 (4): 349–392. doi:10.1007/s00407-007-0016-4. Dickson, Leonard Eugene (1919). History of the Theory of Numbers, Volume II: Diophantine Analysis. Carnegie Institution. Reprinted as Dickson, Leonard Eugene (2013). 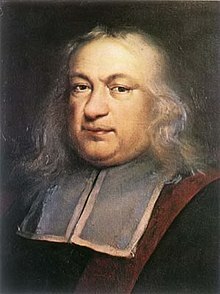 History of the Theory of Numbers, Volume II: Diophantine Analysis. Dover Publications. ISBN 978-0-486-15460-2. Dunnington, G. Waldo (1955). Carl Friedrich Gauss: Titan of Science. A study of his life and work. Hafner. Reprinted as Dunnington, G. Waldo; Jeremy Gray; Fritz-Egbert Dohse (2004). 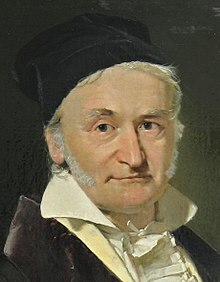 Carl Friedrich Gauss: Titan of Science. Mathematical Association of America. ISBN 978-0-88385-547-8. Gray, Mary W. (2005). “Sophie Germain”. In Bettye Anne Case; Anne M. Leggett. Complexities: Women in Mathematics. Princeton University Press. pp. 68–75. ISBN 0-691-11462-5. Gray, Mary (1978). 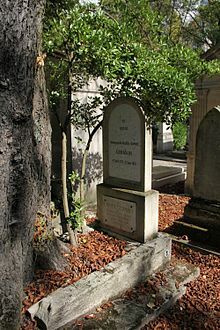 “Sophie Germain (1776–1831)”. In Louise S. Grinstein; Paul Campbell. Women of Mathematics: A Bibliographic Sourcebook. Greenwood. pp. 47–55. ISBN 978-0-313-24849-8. Mackinnon, Nick (1990). “Sophie Germain, or, Was Gauss a feminist?”. The Mathematical Gazette 74 (470): 346–351. doi:10.2307/3618130. Moncrief, J. William (2002). “Germain, Sophie”. In Barry Max Brandenberger. Mathematics, Volume 2: Macmillan Science Library. Macmillan Reference USA. ISBN 978-0-02-865563-5. Mozans, H. J. (pseud.) (1913). Women in Science: With an Introductory Chapter on Women's Long Struggle for Things of the Mind. D. Appleton. pp. 154–157. https://archive.org/details/womaninscience00zahmrich. Ogilvie, Marilyn Bailey (1990). Women in Science: Antiquity Through the Nineteenth Century: a Biographical Dictionary with Annotated Bibliography. MIT Press. ISBN 978-0-262-65038-0. Osen, Lynn M. (1974). Women in Mathematics. MIT Press. pp. 83–94. ISBN 978-0-262-65009-0. Petrovich, Vesna Crnjanski (1999). “Women and the Paris Academy of Sciences”. Eighteenth-Century Studies 32 (3): 383–390. JSTOR 30053914. Sampson, J. H. (1990). “Sophie Germain and the Theory of Numbers”. Archive for History of Exact Sciences 41 (2): 157–161. doi:10.1007/BF00411862. JSTOR 41133883. Ullmann, D. (2007). “Life and work of E.F.F. Chladni”. European Physical Journal ST 145 (1): 25–32. doi:10.1140/epjst/e2007-00145-4. Waterhouse, William C. (1994). “A counterexample for Germain”. American Mathematical Monthly 101 (2): 140–150. doi:10.2307/2324363. JSTOR 2324363. O'Connor, John J.; Robertson, Edmund F., “ソフィ・ジェルマン”, MacTutor History of Mathematics archive, University of St Andrews, http://www-history.mcs.st-andrews.ac.uk/Biographies/Germain.html .